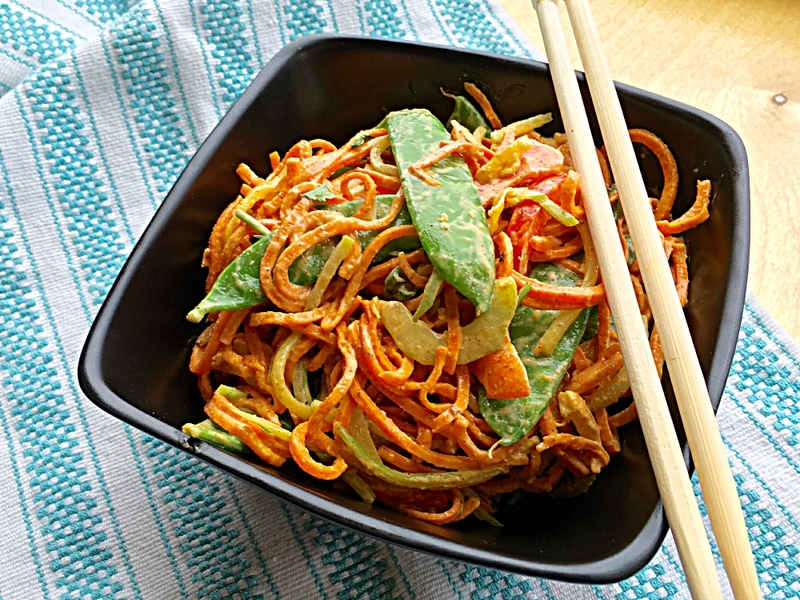 Here is a low carb twist on an old favorite that I used to make with gluten-free noodles. 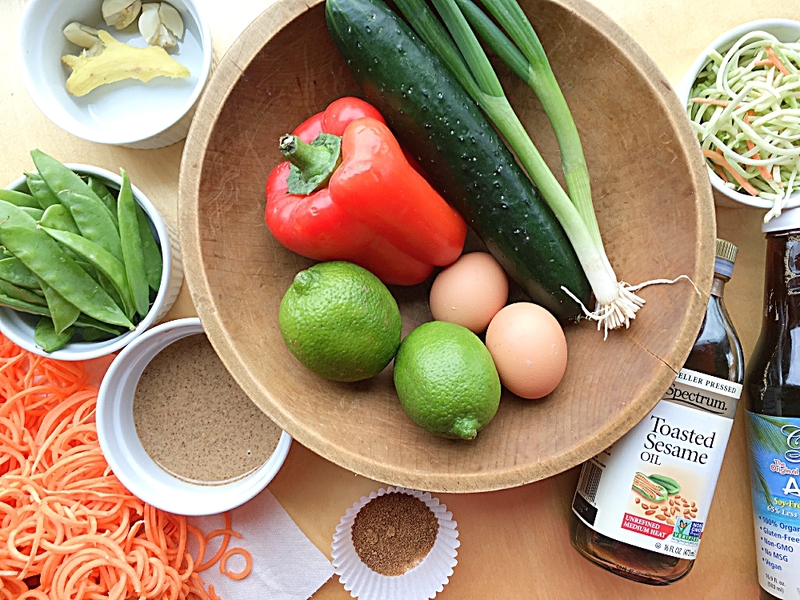 Pad Thai Sweet Potato Noodle Bowl is something that can be made ahead and used as a side or for lunch throughout the week. We just returned from a get away to Red Mountain, which is our very favorite place to ski. We were there a few days and while we packed food for meals, I packed light to keep it simple. 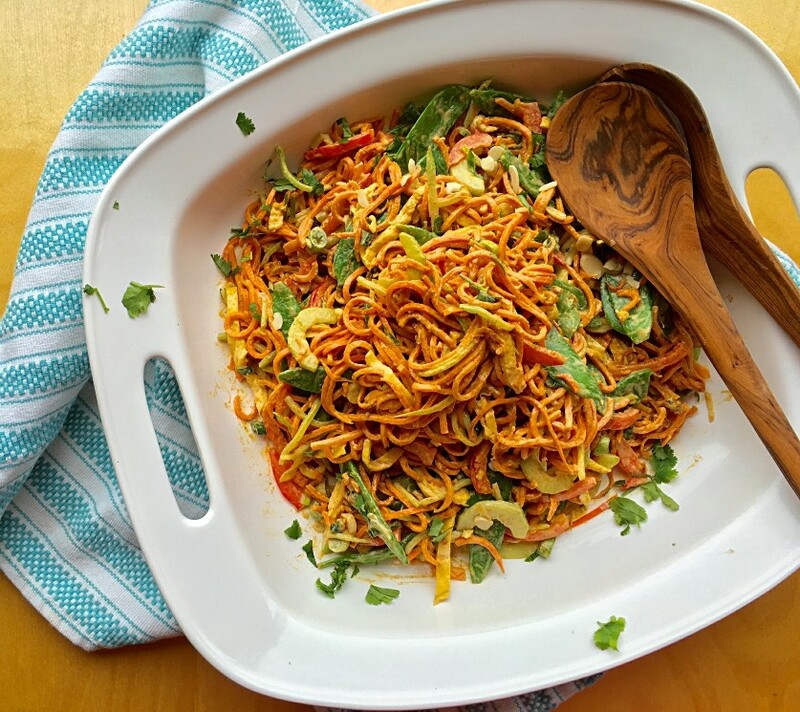 I’ve got to tell you I missed my spiralizer so much that the first meal I made when home included 2 recipes using my beloved spiraliser. 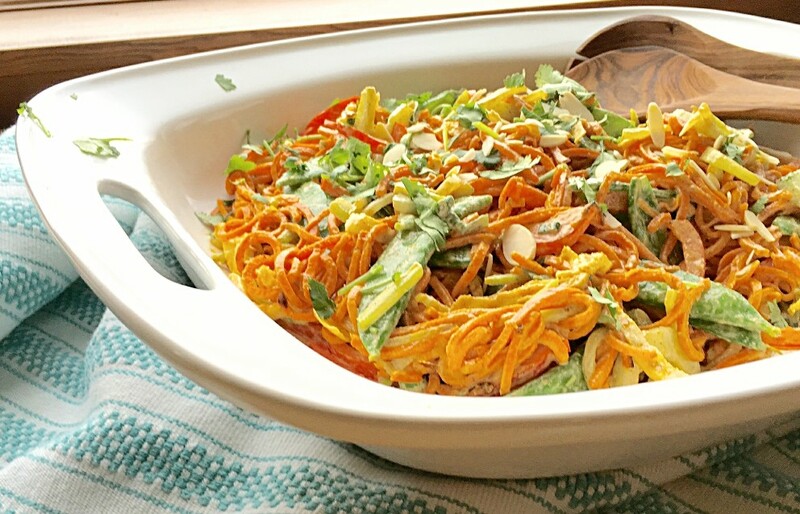 This vibrant Thai inspired dish makes an impression. I couldn’t stop thinking about it. Couldn’t wait to get home and make it again. 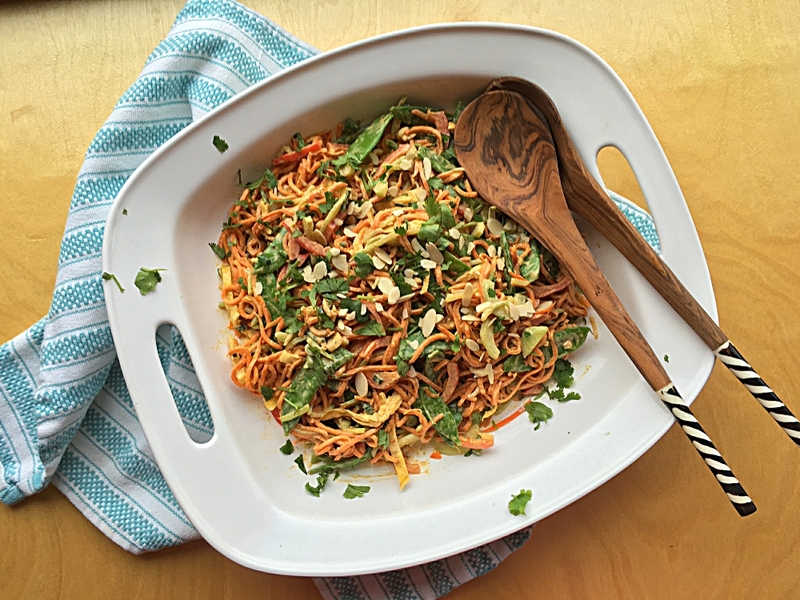 You can simplify this meal in a bowl by limiting the veggies you put in the salad. It’s a priority to get as many veggies on my plate as possible, so I pass that on in my recipes on here and in my classes. I realize not everyone loves to cook as much as I do, so you may choose to modify but using less veggies in this recipe. This salad bowl includes a combination of quickly blanched vegetables and raw to add a welcome crunch. 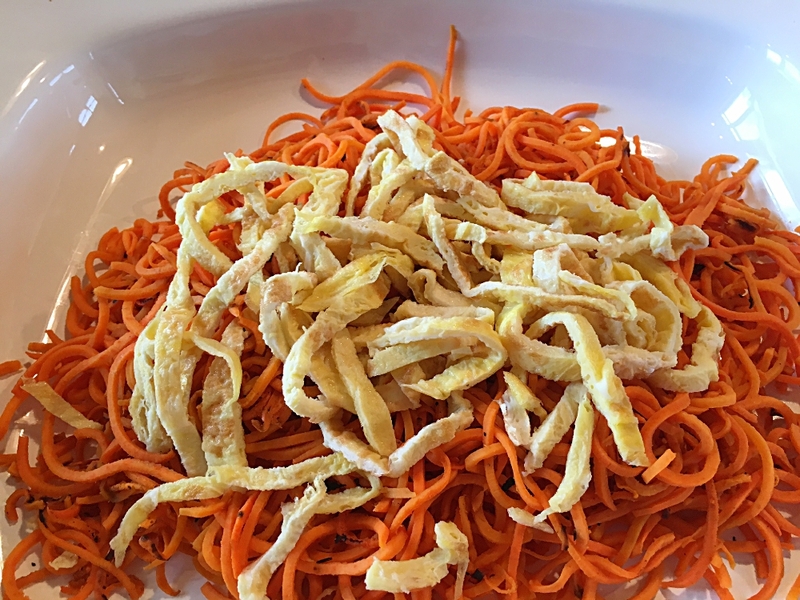 You can also change it up by adding cooked chicken instead of shredded egg pancake. But the eggs in this are awesome! You want to cook them up like you would an omelet. They get overdone easily so watch out for that. Once cooked, let cool, roll it up like a cigar, and slice thin. Sauce ingredients go right in the blender. Blend until smooth and creamy. 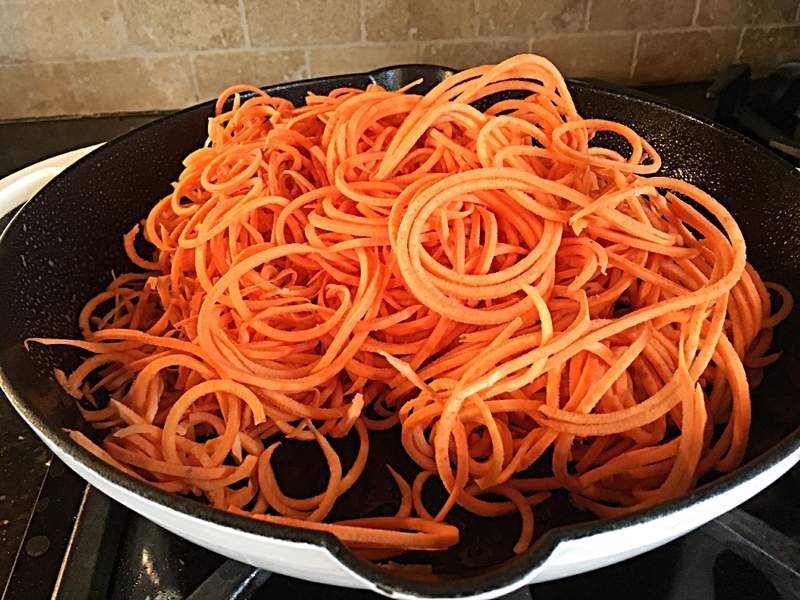 Using a large skillet, saute up the sweet potato noodles in some olive oil for 15 minutes. Add some sea salt and eventually a little bit of water to keep them from sticking. Keep in mind their volume cooks down some. Side note: this pan is cast iron inside, enamel covered outside. It’s 12 inches wide and I never thought I would use it as much as I do for just the 2 of us! Got it at Target – Threshold brand; for $24.99. Follow me on instagram, @ ag_thefreshtable, and you will see a video in my feed demonstrating quickly cooked leafy greens using this pan. Okay, commercial over. Let’s assemble the salad. Place cooled cooked noodles in first. Layer eggs and veggies on top. 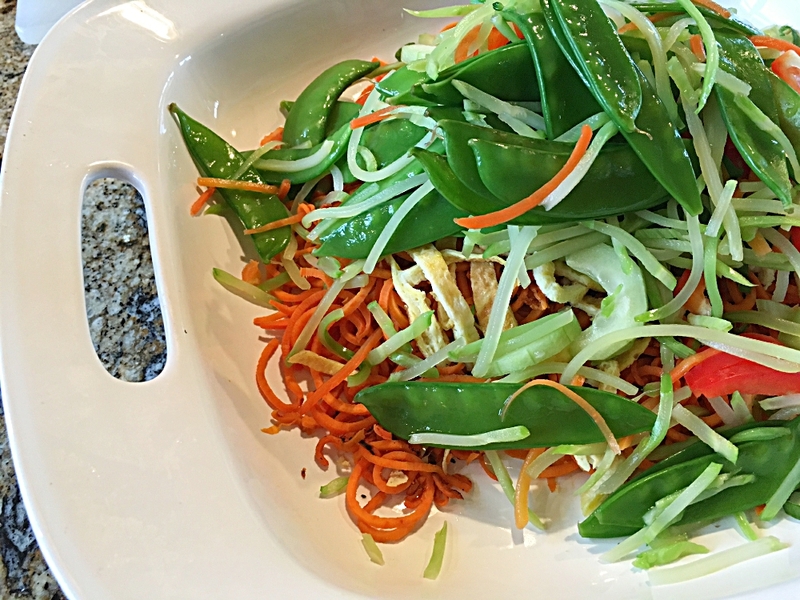 Toss raw veggies in, add sauce to your liking and toss. Taste and adjust seasonings. Top with cilantro and chopped salted peanuts if desired. Bring a medium pot of salted water to boil. Prepare a bowl with ice water. I like to use my salad spinner for this. Use the bottom bowl for ice and set the colander section above the ice. Add cold water. 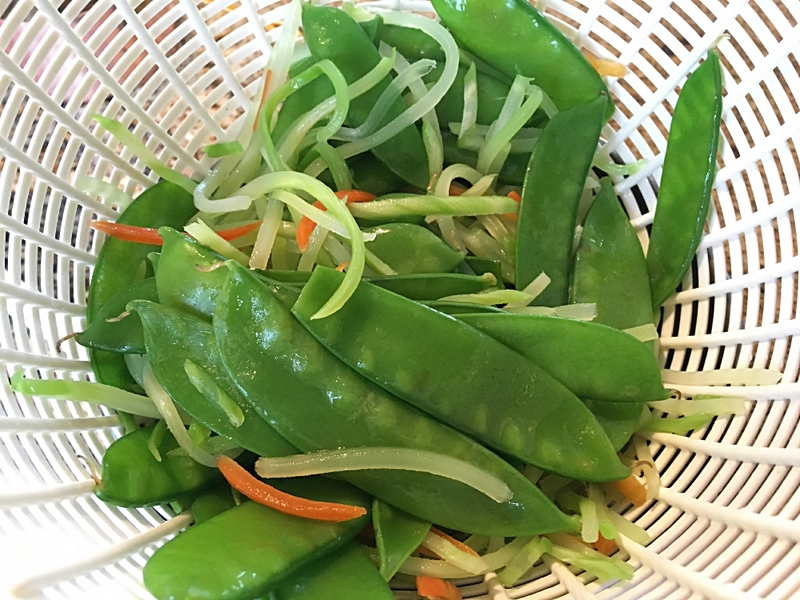 When water boils, drop the snow peas in for a minute to blanch. In the last 15 seconds drop in the broccoli slaw. Scoop out with a colander and set in ice water bath for 2 minutes. Lift colander bowl up out of ice and let veggies drain. 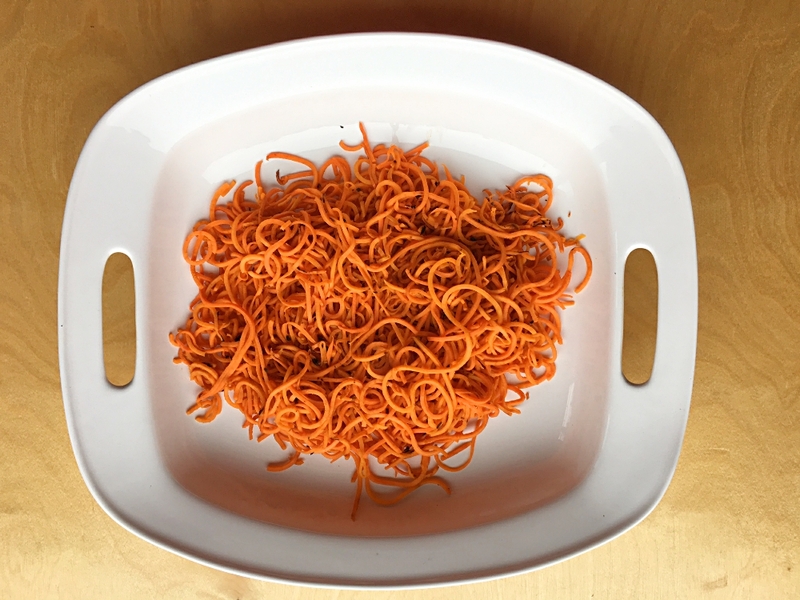 Rinse out the same pot, heat it and saute the sweet potato noodles in olive oil, stirring to coat them. Add a pinch or 2 of sea salt, and stir off and on for 15 minutes on medium heat to cook the sweet potatoes. At some point you’ll want to add about 1/4 cup of water to keep them from sticking to the pan. Remove and place in serving bowl. Make the sauce by putting all ingredients in a high-powered blender and blend until smooth. Heat a skillet on a medium heat and add some olive oil. 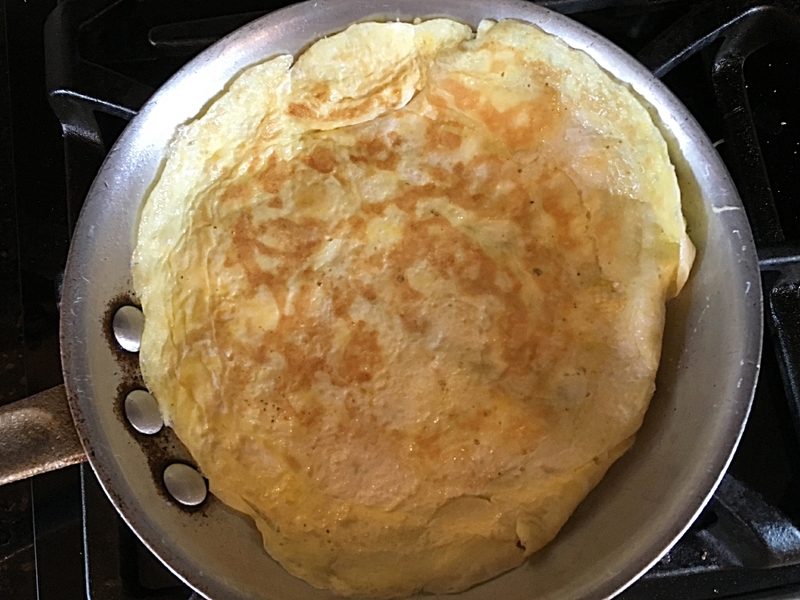 When skillet is hot, pour in beaten eggs and cook like you would an omelet. When one side is done flip and cook the other side for another minute. Remove and let cool. When cool, roll up like a cigar and chop in strips. 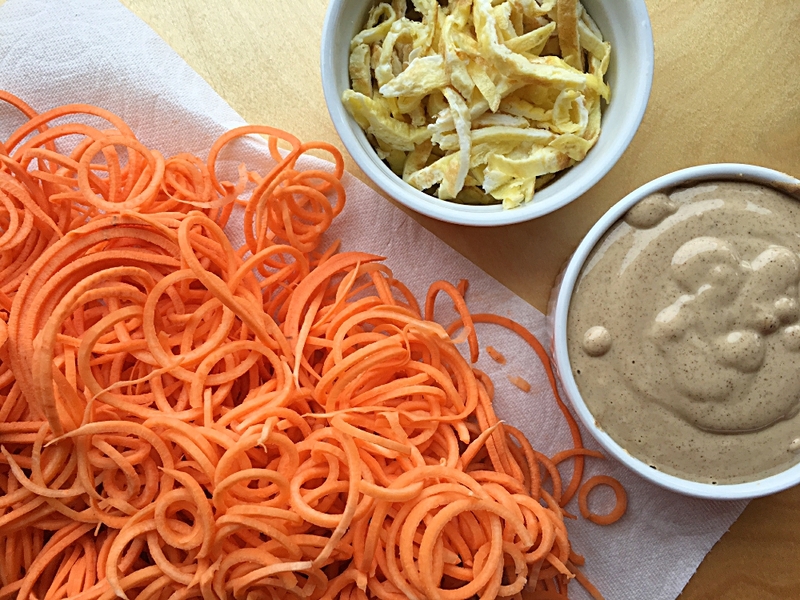 Combine egg, blanched veggies, raw veggies, sweet potato noodles and sauce all together. Taste and adjust seasonings. Garnish with fresh chopped cilantro and/or chopped salted peanuts. Option to use leftover cooked chicken in place of egg in this recipe. What kind of a spirilizer do you recommend. ..? 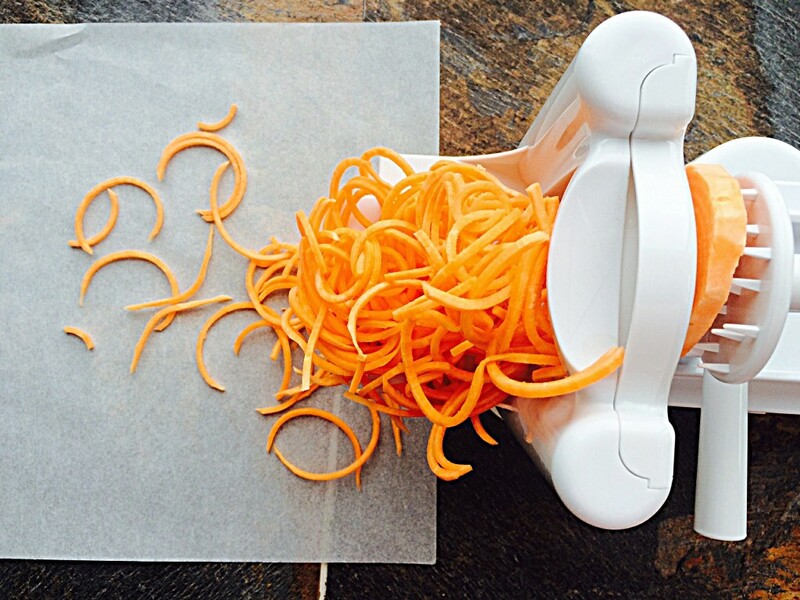 Hi Ken, I use the Paderno 3 blade spiralizer. It sells for about $30.00 and is available on Amazon. Hey there Susan! I think for a potluck this could stretch to serve 6-8. If you want to make more just add another sweet potato. The sauce recipe is generous and would accommodate a larger salad. Let me know how everyone likes it and have so much fun! ,axe it last night. Delicious. I think I overcooked the sweet potatoes. Kind of broke up. Not as pretty as yours but I can’t wait till lunch!!! I’m so glad you liked it Marcia! I just made this for the first time last night! so SO delicious!! Yay!! I love getting this kind of feedback. So happy you loved it! Thanks Carly!